Kaikai Kiki Gallery is proud to announce that, from April 6 to May 3, 2018, we will be presenting “Azimuth,” a solo exhibition of works by James Jean. Born in Taiwan and based in Los Angeles, James Jean has been recognized both in the U.S. and internationally after initially making a name for himself as an illustrator in the early 2000s. Since then, Jean has accumulated more than a decade’s worth of exhibition history across New York, Los Angeles, London, Hong Kong, and Tokyo; produced a major collaboration with Prada; and worked on various projects with such notable names as Apple and Beats by Dre. Jean has surely begun to establish himself as a creative force unhindered by the confines of categorization, and his upcoming show at Kaikai Kiki Gallery will highlight his artistic evolution through a brilliant array of paintings and drawings, complemented by an installation of glowing stained glass centerpieces. The title of this exhibition, “Azimuth” – defined as the position of a celestial object in the sky in relation to the Earth’s horizon – poetically alludes to the artist’s internal compass in approaching the creation of these works, guided forth by the energy of blood bonds and filial love. Jean’s signature artwork style of delicate lines and ambient tones, described by many as moody dreamscapes of the fantastical and romantic, have often tended to veer into muted, darker themes. “Azimuth,” however, marks a turning point in the artist’s emotional landscape: The heart of the exhibition plays on the radiance of color and light, and conveys the hope of a somber spirit re-saturated by the brightness and innocence of his son’s childhood. We invite you to come witness the artist’s journey this time as he transcends his own atmospheric limits and embarks toward a new horizon. “It’s been a long time since my last major solo show. In my mind, it feels like it just happened, but when I look at the calendar and count the years, I run out of fingers on one hand. Time is set at a terminal velocity and my brain drags in the distance – memories glimmer dimly like ancient stars in a rapidly expanding universe. You see, I can easily veer into the familiar darkness of space. But as a reaction to my previous work, I’ve fully immersed myself in light, igniting a sun to reveal a realm of ultimate optimism and innocence, encouraging the shadows to retreat into their crevices and obediently delineate the form. I’ve created portals of stained glass, through which light can travel and discharge bursts of color. The heavy black lines surrounding the glass, made from bending strips of soft lead, resemble the drawings in the stacks of coloring books that surround my studio. On my journey to work, my feet are often impaled on shards of broken crayons as I travel around piles of hyper-colored rubble, the tiny artifacts of my son working their way into my flesh. My first son, shining sun, nuclear powered, radiating an ultraviolet light that kills the germs in my mind and clears the mold from my eyes. With the filth gone, I can see and use color in a new way. Heavily pigmented and obsessively layered, the paintings reflect light at maximum chroma. The color is pure, free from the umbers and contamination of a sophisticated, entropic world. I first met James Jean when Takanori Aki of Good Smile Company, a Japanese manufacturer of figurines and hobby products, took me to visit him at his studio in LA. At the time, he was sharing a studio space with David Choe and there, James showed me a few sketchbooks full of pages densely covered in his drawings on both sides. The studio felt energetic in a chaotic way, exuding a sense of wildness. After touring the space, we got in David Choe’s classic car, and I was taken on a ride around downtown LA. The visit made quite an impression on me, seeing how they seemed to be producing their work in this free, quintessentially West Coast atmosphere. A few years later, the aforementioned Takanori Aki asked me to write a blurb for the Japanese edition of James’s art book and I got to see the English edition of the book, which included a number of exquisite works I had previously seen at his studio. Realizing how James had kept on with his drawing all that time, I was impressed. Many of us who end up pursuing art are not good at communicating through language or showmanship. One of the reasons we are not adept at manipulating words is because our imaginations tend to gush out all at once, making it hard to identify our main point that is required for verbal expressions. But in a sketch, it’s possible to illustrate all those simultaneous visions and show them to others. I think that in James’s sketches, which don’t depict a perfunctory context but record the trajectory of multiple thoughts, resides his own language original to his brain. I remember writing something for the blurb based on such observations. After a few more years, James stopped by at a small café I operate in Nakano, Tokyo, saying he would like to meet with me while he was visiting Japan; he had come to attend the opening of one of the Juxtapoz Magazine artists’ showat our gallery. And so I had a chance to meet him once again. When I first met himyears ago James still looked like a teenager, but this time, with his hair grown out, he looked much more like an artist. We sat down in my café and chatted together with Evan Pricco, Juxtapoz Magazine’s Editor-in-Chief, and I brought up an idea of James doing a show, a drawing exhibition perhaps, at one of my small galleries in Nakano, affiliated with the café. He immediately agreed. Soon after our conversation, in November of 2015, we opened his solo show. Once again Evan came for the opening and the three of us were casually chatting at the café when James mentioned how he wanted to make a foray into the fine art world. I was taken by surprise. Wasn’t James already respectably famous, dealing personally with his clients and being properly recognized? Already managing many successful collaborations all by himself, what did he feel he stilled lacked? When I asked, he became shy and wouldn’t articulate. It was then that Evan explained, “Actually, Takashi, in truth most of Juxtapoz Magazine artists share James’s unfocused frustration about not being able to join the contemporary art arena. Museums don’t even take note of them. ”This was news to me, but when I looked back on my own career, I had managed to make my way into the contemporary art scene centered around NY by making my approach from the periphery, such as LA and Paris. I also curated various exhibitions such as Superflat and Little Boy that explained the juncture of Japanese post-war culture and contemporary art before I could finally make myself understood. It seemed to make sense, so I, who was one step ahead at the bottom rung of contemporary art world, decided to plan an exhibition that explored the cause of such a frustration together with Evan. The result was the Juxtapoz x Superflat exhibition, held at an alternative space (Pivot Art + Culture) owned by Steve Ballmer in Seattle and the Vancouver Art Gallery. The exhibition itself was well-attended and was well-received on social media, but perhaps because it lacked a clear focus, it didn’t make much of a splash at all in the art scene. Its intended theme had been to first level and explain contemporary art in my Superflat way of thinking and then to draw a bridge to it from the Juxtapoz Magazine works, which don’t follow the rules of contemporary art—works with information overload, if you will. I realized we had quite a lot of work cut out for us. When you think about it, the founder of Juxtapoz Magazine Robert Williams started the magazine because he felt his kind of art had no other place to reside. When he was included in Helter Skelter, the exhibition curated by Paul Schimmel at the Museum of Contemporary Art, Los Angeles in 1992, as one of the artists seemingly spouting out from the American West Coast at the moment, it appeared as though he was finally about to gain entry into the contemporary art context. Yet the show ended up pushing the likes of Paul McCarthy, Mike Kelley, and Chris Burden to their stardom, leaving Williams an outsider. And so Juxtapoz Magazine carried on. What, then, bridges this Juxtapoz Magazine art and contemporary art? The idea I had come up with was the collision between the narrative context and the narrowly defined rules of contemporary art. The presence of Asia is increasingly felt in the art market, and reworking the rules to accommodate the needs in Asia seems like an urgently needed task. If contemporary art ignores the narrative wave in Asia, even for the time being, it might end up firmly closing its doors and shutting itself up, becoming a narrowly defined religion of a sort. Yet contemporary art is not prepared to take that drastic step. If the way of contemporary art is to exclude the narratives and to perpetually update the rules of its game in inflating abstractness, why is narrative art so popular in Asia despite such rules? By analyzing the logic behind this, I think it would be possible to work narrative art into the context of contemporary art. Narrative art, in this sense, may be in a similar position as Star Wars in the world of film. What ended the revolutionary era of cinematic expressions through American New Wave and Nouvelle Vague was Star Wars, a film constructed based on a mythology-based narrative worldview that was largely considered childish. Despite having changed the current of film history, the creator of Star Wars, George Lucas, to this day, has been disproportionately underrated for his tremendous achievement. And Lucas is now planning to open his Museum of Narrative Art in LA in 2020. Will narrative art manage to strike back? In the world of art, a narrative worldview has an unfortunate placement where, despite its ability to execute, it just cannot win enough respect. And yet, an ever-increasing number of audiences support and desire narrative. It’s an eventuality, then, that the worldview embodied by Juxtapoz Magazine will come increasingly closer to the world of contemporary art and, after a few generations, it will receive its due recognition. Here’s a good example. At the 2018 Academy Award, the fantasy film The Shape of Water by the Mexican director Guillermo del Toro won the Best Picture award. In a sense, the format of a monster B-movie has been acknowledged as the best of the year in American film. At the origin of images Guillermo del Toro creates lies the history of George Lucas-esque films that were deemed childish. I think the moment del Toro’s film won was the moment it was proven that such supposedly childish context can effectively deal with themes like human dignity. It is fitting that James Jean, who is active in the narrative area of the art world, created the marketing illustration for The Shape of Water. This image, too, may be viewed as being confined in the world of illustration, underrated for now. But wait and see: in the near future, when the young people growing up seeing and loving The Shape of Water now are grown and start to think about various aspects of artistic expressions, they will sublimate the childish worldview into an elevated status of thoughts. They will melt away the boundary that now exists. 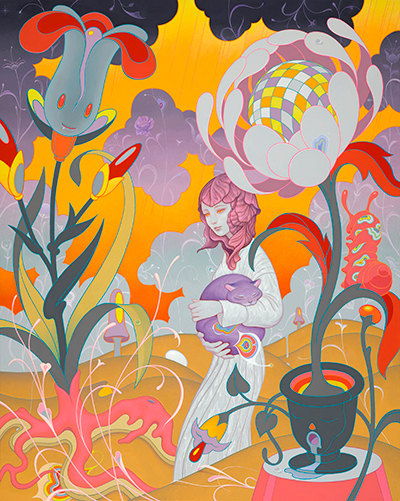 James Jean is an artist of the narrative world. But he is not an illustrator that embodies his clients’ wills in his work. He is an artist who can visually express various languages of thoughts; an artist who is meant to hold center stage going forward.